One method of synthesizing emeralds is called flux growth. During the flux growth process, flux, a substance that reduces the melting point of surrounding material, is combined in a metal-lined crucible with the elements that make up emerald. The crucible is heated until its contents are liquid and then it is allowed to cool very slowly. As cooling continues, the gem mineral crystallizes from the solution. Flux grown synthetic gems can take up to a year to grow to a facetable size, but the exceptional clarity of these gems is well worth the wait! Synthetic gems have the same chemical, optical, and physical properties of their natural counterparts, but are a more cost-effective alternative to a natural gem. Refractive index, birefringence, optic character distinguished beryl from other materials, but magnification is essential for separating synthetic beryl from natural material. 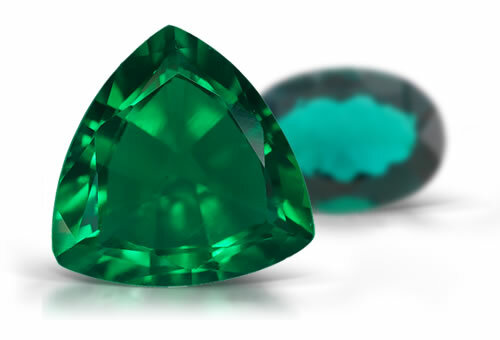 Flux grown emeralds might exhibit residual flux inclusions that look like wispy veils, fingerprints with interconnecting channels and sometimes the inclusions will appear course or give a cloudy or cottony appearance. Stones often show 2-phase inclusions. Occasionally platinum crystals from the crucible can be seen in the stone. Sometimes synthetic phenakite or chrysoberyl crystals can form. Stones often show uniform growth planes.